Can be Easy and Fun! Memory Book Company offers a simpler way to create beautiful yearbooks or memory books. Our popular online yearbook design program, creative cover and background choices, innovative printing enhancements, and quality binding options will help you capture the unique spirit of your school and students in a yearbook they’ll cherish. Look at what's NEW this year! There are no pesky shipping charges to deal with. Just order and we ship standard for free. We make sure you receive your yearbooks on the date that we promise they will arrive. We stand by this guarantee. If they are late, we will give you money back for each day they are delayed. You are no longer the money collector when you sign up with our secure, online parent pay option. Create a yearbook theme using our professionally designed covers with matching backgrounds. We work with you one-on-one. Contact your personal representative with any questions you may have. We will help you sell your yearbooks by supplying free marketing materials and/or a paperless advertising option through email. Choose from 5 great design options that vary from having your book professionally designed specifically for your school to creating your own through our easy online design program. 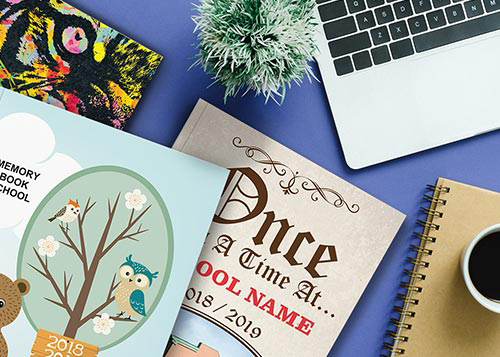 Whether you’re an old hand at creating school yearbooks or are just learning the basics, you can depend on Memory Book Company to make it a great experience. We provide unparalleled yearbook publishing customer service to help you create beautiful, top-quality yearbooks your students will treasure for years to come. Sign up early in the year for the best deals on your order. If you want a mix of great price without sacrificing quality, we are the yearbook publisher for you. When looking for the perfect yearbook layout and unique designs, Memory Book Company has got you covered. We have a great collection of covers to choose from with coordinating backgrounds. Use our easy online design program to make your book look fabulous with a yearbook theme throughout, or if you need help with yearbook ideas, our talented design team will be happy to create a one-of-a-kind yearbook layout and design for you. We have something for everyone. Just contact us for pricing. Our world-class technical team can help you get through any technical issues you may have. You can give them a call at 1-877-302-3140, watch instructional webisodes we have posted on our site or sign up for a webinar held by one of our team members. When you choose Memory Book Company, you choose to have a quality yearbook. We make sure that your expectations are met by sending each design through an extensive proofing process. Jazz up your yearbook design with clipart from our extensive collection. Many of our covers have matching clipart to help you create a yearbook theme. If you would like to see an example of what we can do for you, just request a free sample or idea book. Our idea books show different design elements that can be used in our online design program, and are so much more than your ordinary free sample. We work with thousands of schools and many photographers across the country. Getting your class portraits is easy! Your photographer can provide you with a PSPA compliant disk that can be sent to us using the envelope in your creation kit. Memory Book Company will upload the pictures for you. WOW is the word and expression I just felt as I opened another package today from Memory Book Company. You worked fast for me. Thank you again for all you have done for me to get me moving to complete this yearbook project. In the past six years that I've worked with Memory Book Company I've not had ONE complaint with the finished product and I have increased the order EACH year because they've kept the price economical. 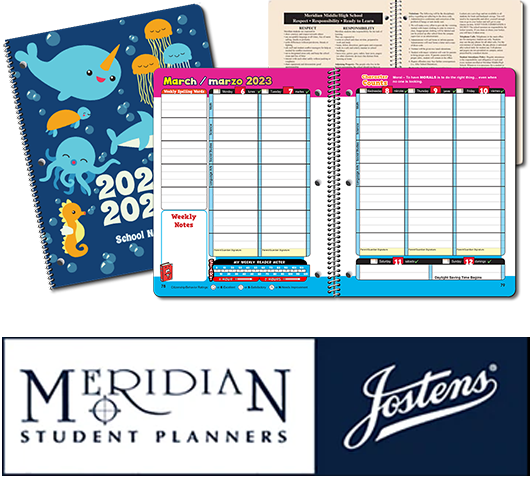 With prices starting at just $2.40, Meridian Student Planners is your planner solution. Yearbook means YOURbook at Memory Book. With YOURbook, you’ll get a satisfaction guarantee, a delivery guarantee and NO HIDDEN FEES on your yearbook invoice. Request a free, no obligation quote. Fill out the form below and a sales consultant will e-mail you a quote by the next business day. Don’t forget to ask us how EVERY student can participate in signing day. By clicking Submit you agree to receive email communication from Memory Book Company. We protect your email address and you can opt out at any time. Congratulations to our $250 Amazon.com Gift Card Winners!